You ever just watch a movie and say, damn….why did this movie bomb at the box office?!? This time we are talking about 2012’s Dredd, starring Karl Urban. I remember seeing this movie in theaters, oddly enough on a radio promotion, and was just dazzled at how epic the movie was. The first time I had ever seen the character Judge Dredd was the 1995 movie with Sylvester Stallone…and let’s face it, it wasn’t good. It was plenty of years since Judge Dredd was seen in theaters, but when 2012 hit we got ‘Dredd,’ the character was brought back to an amazing spotlight…or so I thought. The movie didn’t do very well at the box office as it barely squeaked by to make some kind of profit, but because of it not attracting a large audience, this may be the last time we see the Judge, Jury, and Executioner on the silver screen. While it may not have been the big money maker, critics LOVED the movie…but that’s not enough when it comes to financing a sequel. Karl Urban is quite possibly the best Dredd, a perfect choice to play the role. Also the fact that you never see his face and he never smiles adds to who the character is supposed to be, in the 1995 movie…it’s basically a buddy cop movie with Rob Schneider. 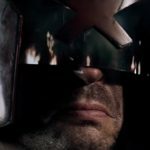 If you have never seen Dredd and love action movies, then what are you waiting for? Go rent it or buy it, whatever.